I hope to develop an environment in which young people can realise their ideas and realise themselves…. Hello and welcome to my first blog. I am on a quest to stay reflective as both a professional and a researcher. I am currently undertaking a part-time professional doctorate in the Drama Department at The University of Manchester. 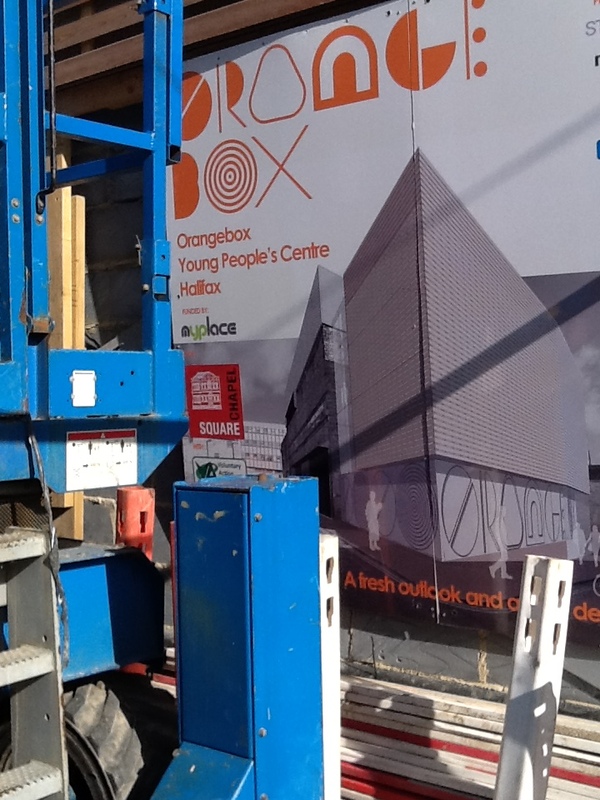 Half way into my six years of study and my professional and research interests have suddenly significantly fused as I find myself the Director of Orangebox; a brand new multi-purpose, arts-inspired young people’s centre in Halifax, West Yorkshire due to open later this year. Orangebox has been created through funding from the Big Lottery’s myplace programme dedicated to creating new world-class facilities for 13-19 year olds. To date, the project has been managed by Square Chapel Centre for the Arts in collaboration with a range of local partners including Calderdale Council and Voluntary Action Calderdale. My post and that of the centre manager are funded for three years by The Esmee Fairbairn Foundation, after which we need to be financially sustainable and may well have become an independent organisation in our own right. Orangebox will house a range of support services as well as providing space and facilities for creative, recreational activity and informal learning, including a public café, a rooftop garden, a performance space, four music rehearsal rooms, a recording studio, a visual arts space, and a skate-park. In my next blog I will share more about the mission, vision and values for Orangebox and the broader Calderdale context. As an adult appointed to a leadership role within a young people’s centre it is vital that I maintain a degree of detachment and objectivity in order to create structures and systems that authentically enable young people’s ownership of the organisation as opposed to exclusively projecting and furthering my own interests and vision In short I need to keep my ego in check! Incidentally I think that research is an excellent leadership discipline in any field because it forces you to look at what is already known or has been said before announcing your own intentions; to think about ethics; to plan ahead; to focus on using the most appropriate and effective methods; and to consider how your own subjectivity might be informing or clouding your judgment. Through my research I am trying to develop processes for articulating and supporting spiritual wellbeing in an everyday, (rather than a sacred) sense. As such I am interested in how we can better embed concepts such as responsibility, meaning-making, and self-transcendence (or seeing yourself in the context of a ‘bigger picture’) in our everyday lives. Specifically I am researching ways of fusing theoretical and practical understanding from the fields of logotherapy, performance and theatre studies to develop a form of spiritual wellbeing practice for use in health, education and personal development contexts. ‘Spiritual’ isn’t the easiest or most comfortable word to use and that’s where logotherapy comes in! Logotherapy is a form of psychotherapy devised by the twentieth century neurologist and psychiatrist Viktor Frankl who claimed that finding meaning is the primary motivation for living and that our search for meaning is guided by values and conscience; an intuitive capacity to find out, to ‘sniff out’ the unique meaning inherent in a situation. Frankl’s seminal book Man’s Search For Meaning was written in the first year of his release from World War II concentration camps to which he lost is parents, brother, and wife. Frankl’s friends persuaded him against publishing Man’s Search For Meaning anonymously. It has now sold millions of copies all over the world. It describes his experiences and observations in three concentration camps through the lens of logothearpy’s philosophy. My research argues that theatre and performance studies offer theoretical and practical knowledge that complements and extends logotherapy through its understanding of kinaesthetic, embodied, and collective forms of meaning-making and the meaning derived through experiencing transformation, empathy and ‘otherness’. Hence my ambition to fuse the two. – a critique of relevant literature and concepts from fields of philosophy, business and organisational development, health and wellbeing, theatre and performance studies. Wish me well then and I look forward to involving you in my quest; advice, top tips, warnings, and encouragement all welcomed! This entry was posted in Uncategorized and tagged drama, leadership, logotherapy, research, youthwork. Bookmark the permalink. The idea of seeing yourself within a bigger picture is of course difficult to bring to life especially within the age range you’re working with but I think the likes of Jason Silva and Ray Kurzweil do a fantastic job of trying to define just how significant we are (as a species – rather than individuals) at the same time as emphasising just how insignificant we are when compared to the size of the universe. . . Perfect Dave, thank you so very much indeed! Please keep following and commenting! Sounds like a great project. Good luck with it. I’d like to help if you have any questions about logotherapy. That would be great, thank you very much indeed, I will email you!